on the woodside. : *neato burrito. This one might seem a little insane (but I swear I'm not the first to try it; it's not an original idea! ): the chicken tikka masala burrito. The great news is that even if you don't relish the idea of taking your carbs and wrapping them up in other carbs (you might want to get that checked out), this tikka masala recipe remains one of my absolute favorite indulgences. So if you balk at burrito, you should probably make the masala anyway. I can't remember where exactly I first stumbled across this notion, but there's a solid chance it was here, so that's where I shall give credit. It's definitely where I was inspired to add cheese, so that is where my arteries can assign blame. I wasn't brave enough to add beans (introducing yet another carbohydrate to the scene just seemed too decadent—I am nothing if not moderate), but I snuck some peas in there because I love them in my tikka masala rice and they added pretty color. I knew I had to try these out on the perfect taste-testing pair: my sister (who adores chicken tikka masala) and her husband (our resident Mexicano). So while at home I have a panini press, in this case I just pulled out the trusty George Foreman grill, and George did not let me down. The tortilla was crunchy and golden, so it held up perfectly to the creamy sauce and sticky rice. Verdict? Genius. These are incredibly filling, but you'll have to beat back that voice in your head that tells you to make one more. The low-burning heat of the garam masala and peppers, plus the acidity of the tomatoes, is really very much along the lines of what I think a burrito is all about. And of course there's the additional benefit of having what is essentially a hand pie, ideal for shoveling in large bites (which will be impossible to resist). Mostly, though, I appreciate this for its cheekiness. Biting into something that looks like a burrito but has all the complex flavors of an Indian curry is a happy surprise for your face. And it passes the Joey test with flying colors. Such is the delicious power of putting taking awesome things and putting them together. What's next? Sushi pizza ... Potato-skin macaroni and cheese ... maybe barbecue cinnamon rolls? It's no secret we are living in divisive times. Can't hurt to inject a little spirit of unity into the universe. Unity and carbohydrates. You can find the link to my original post on tikka masala here. However, I have made some tweaks to that recipe along the way, mostly efforts to preserve the flavor but make things slightly less labor-intensive, so I'm reprinting it with edits below. 1. Bring 4 cups water, 1 tablespoon butter, and 1 tablespoon kosher salt to a boil in a medium saucepan. Stir in rice; reduce heat to low, cover, and cook 20 minutes. 2. Toss chicken breasts pieces with kosher salt in a medium bowl. Mix in Greek yogurt, coriander, and cumin. Heat oil in a large, deep skillet over medium-high heat; add chicken and cook 10 minutes or until any liquid has evaporated and chicken is beginning to brown and caramelize. Remove chicken from pan, and set aside. 3. Return skillet to stovetop over medium-high heat, and melt remaining 2 tablespoons butter. Add onions, and sauté until lightly browned. Stir in garlic, ginger, and 1 tablespoon kosher salt; cook 30 seconds. Stir in jalapeño and garam masala; cook 1 minute. Add tomatoes, reduce heat to medium, and simmer 5 minutes. 3. Reduce heat to low, and stir cream into sauce. Stir in reserved chicken and cilantro; cover and keep warm. Add peas to cooked rice, stirring until heated through. 4. 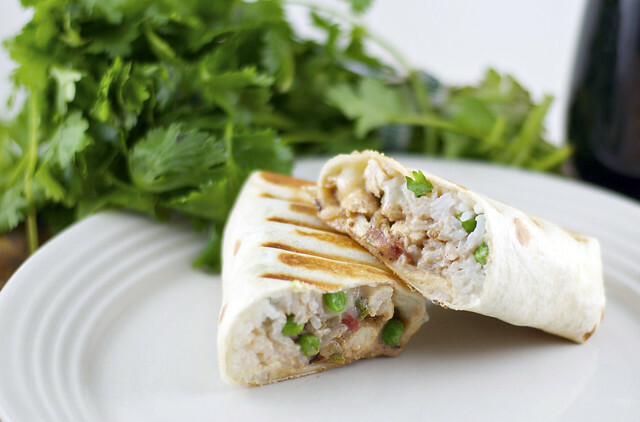 Place 3 to 4 cheese slices along the length of each tortilla; fill with equal amounts rice and chicken mixture, and roll. 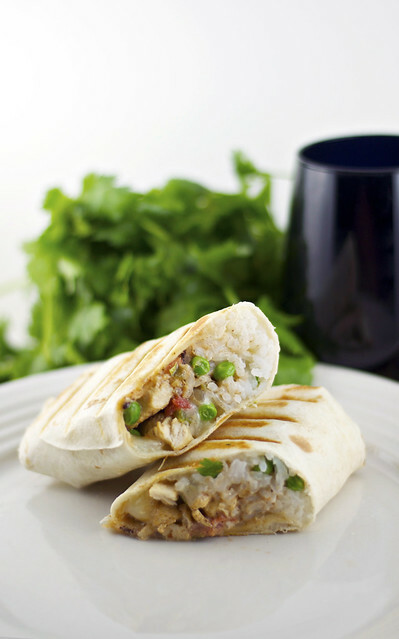 Spray double-sided grill or panini press with cooking spray; grill burritos 2 minutes or until lightly golden. Makes 8 servings. oh yum! That combines two of my favorite dishes- definitely going to try! Right?! These two were star-crossed lovers. Meant to be together in my tummy. Hope you enjoy!